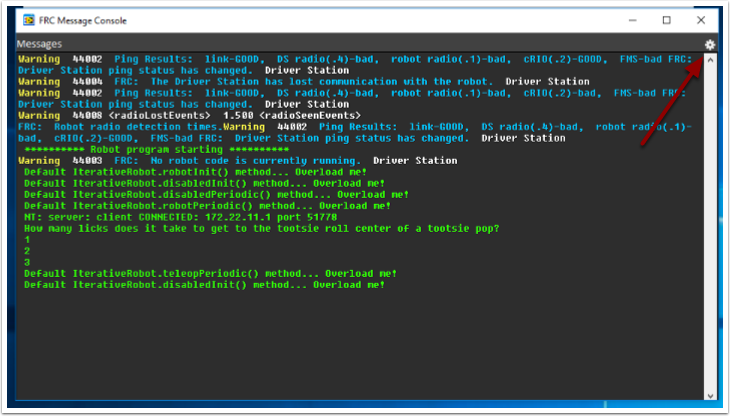 For viewing the console output of text based programs the roboRIO implements a NetConsole very similar to the cRIO. Note that on the roboRIO, the NetConsole is only for program output, if you want to interact with the system console you will need to use SSH or the Serial console. There are two main ways to view the NetConsole output from the roboRIO: The Console Viewer in the FRC Driver Station and the Riolog plugin in VS Code. To open Console Viewer first open the FRC Driver Station. Then click on the gear at the top of the message viewer window (1) and select "View Console". The Console Viewer window displays the output from our robot program in green. The gear in the top right can clear the window and set the level of messages displayed. The Riolog plugin is a VS Code view that can be used to view the NetConsole output in VS Code (credit for the original Eclipse version: Manuel Stoeckl, FRC1511). By default, the RioLog view will open automatically at the end of each roboRIO deploy. If you want to launch the RioLog view manually, press Ctrl+Shift+P to open the command palette and start typing "RioLog", then select the WPILib: Start RioLog option. The RioLog view should appear in the top pane. 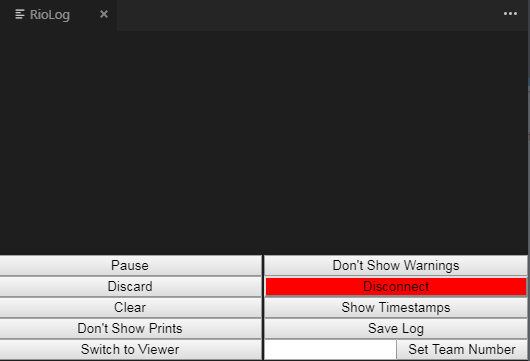 Riolog contains a number of controls for manipulating the console. Pause/Resume Display - This will pause/resume the display. In the background, the new packets will still be received and will be displayed when the resume button is clicked. Discard/Accept Incoming - This will toggle whether to accept new packets. When packets are being discarded the display will be paused and all packets received will be discarded. Clicking the button again will resume receiving packets. Clear - This will clear the current contents of the display.